Drawing inspiration from past Paris-Dakar Rallye heroes and their victorious BMW machines, BMW Motorrad has revealed the Lac Rose concept motorcycle at the Wheels and Waves custom bike festival in Biarritz, France. Apparently, even the R nineT had made its first public appearance as a 'concept' at the same event before it was officially launched by the brand. “The BMW Motorrad Concept Lac Rose is our laid-back and very individual interpretation of the bike that won the Paris-Dakar Rallye in 1985 - fully in line with the spirit of Wheels & Waves and its visitors. It puts the BMW R nineT into an exciting new context and shows what passion for our brand heritage, imagination and a few modifications can achieve.” he further added. The concept bike gets the name 'Lac Rose' from the rose-coloured Retba salt lake that is located 35 km north east of Dakar and hardly a kilometre away from the Atlantic coast. It is at this location that the Paris-Dakar rallye was finished and the winners were allocated with awards by the lakeside. Coming to the motorcycle, the concept bike comes with a new variant of the popular 1,170cc air-cooled boxer twin engine which comes with shaft drive to deliver power to the rear wheel. The engine of the off-road bike is held in a tubular chassis with a distinctively perforated shield at the bottom of the motorcycle. The high-performance parts and valve covers on the engine display the exclusivity of BMW workmanship and the quality standards maintained by the brand. 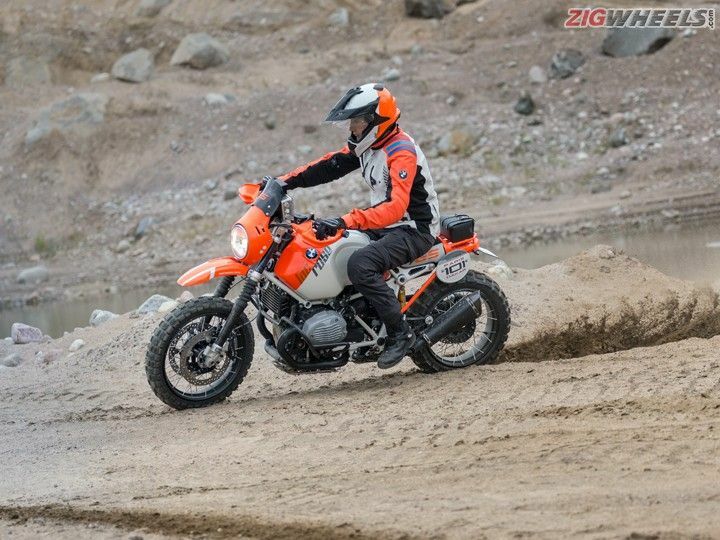 On the styling front, it gets the 1985 Dakar-winning G/S inspired components like the windshield, headlamp, high mudguard, large tank and short seat. The bike has long suspension travel, wire-spoked wheels and studded tyres. The colour combination used is the same Alpine white and Signal red colour scheme which commemorates the championship-winning rallye bike.